The construction of Phase One 50MW Kidston Solar Project (KSP1) is progressing on time and on budget, project proponent Genex Power Limited announced on Monday. Located some 270 kilometres north-west of Townsville in far north Queensland, the 50 MW Kidston solar farm will produce enough energy to power the equivalent of 26,500 average Australian homes each year through the National Electricity Market. Genex told the ASX that first delivery of First Solar Thin-Film solar modules has been completed, with the delivery of NEXTracker components underway. According to the power generation development company, piling rigs have been mobilised to site ahead of pile delivery, and 75% of the Ergon switchyard equipment has already been installed. 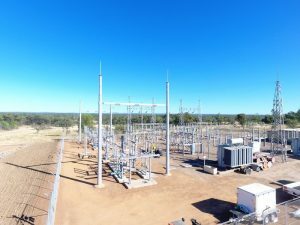 The solar farm substation earth-grid has also been installed, while the laydown area for materials storage and component assembly has been fully completed. The company’s Managing Director Michael Addison said site clearing was close to completion, with the KSP1 on track to achieve first generation in late 2017. “Genex’s focus on project delivery continues with the project continuing to perform to budget,” Mr Addison said.